You may also order directly from iTunes or CDBaby. Use the links below. …features 14 of Ray’s original works for brass quintet. 22 tracks. Duration: 1 hour, 2 minutes. To purchase from Premiere Press, see “How To Order” above. To order from iTunes or CDBaby, use the links below. The music is well crafted, programmatic, contemporary, and has a flavor of Hollywood. Of note is Burkhart's fine work on the piccolo trumpet. 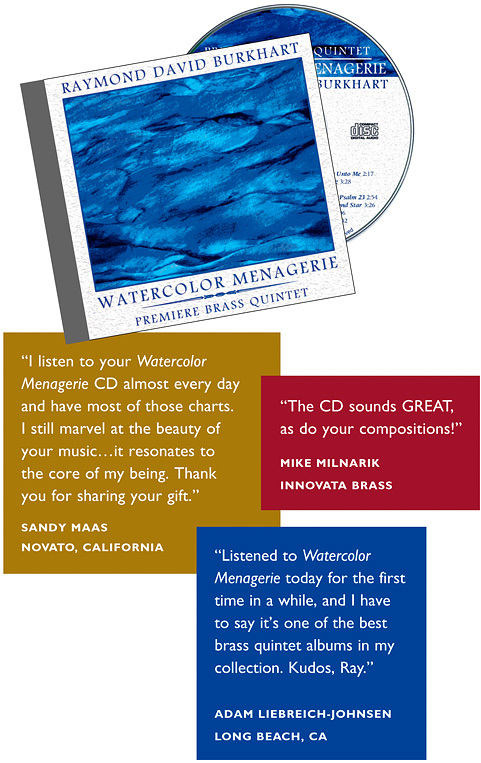 Watercolor Menagerie is worth obtaining by serious brass groups who are looking for fresh material. Music often tells a tale or invokes such a sense of place or time or sentiment that a listener may recollect hopes, humor, loves, and losses that lie strewn in familiar paths of memory. Even when ‘absolute music’ is concerned, concert-goers may find themselves carried into fanciful constructs of their own imagination, unrelated to the composer’s concept, yet resulting from the coincidence of the music’s substance with the hearer’s inspired consciousness. And there are other stories. To know how a composition came to be, or to learn what inspired a piece of music or for whom was it was composed, is sometimes to uncover a story so familiar to our own experience that, by following universal human threads found intertwined in the fabric of a composer’s life, we feel able perhaps to encounter the very thought of composers often twice removed from us. This CD contains 14 of my works for brass quintet. Taken together, they may be an indicator, if not a record, of the story of my life. And for each composition there are many stories I could relate. But, the most important stories are the ones I might never know, private chronicles of how this music is heard and responded to. The great musicians on this recording have been my good friends for many years, and it was both a pleasure and an honor to have them record my music. There isn’t room to print the stories I could tell about them! My deepest thanks go to Kevin Brown, Steve Durnin, Loren Marsteller, Norm Pearson, and Fred Greene, and also to Sonny Ausman and Steven Williams, whose patience and guidance in the recording process were invaluable. Thanks, too, to two of my favorite artists, Jim Tidwell, who many years ago drew my trumpeter logo, and Jeff Leland, whose work with a camera is extraordinary and whose ‘Ice Field’ graces this project. My only regret is that I did not make this recording sooner, when my Mom and Dad could have enjoyed it. With love, and in gratitude, I dedicate this recording to them. As you listen to this music, your experience will be unique, as you are unique. This is one reason why I compose music and the principal impetus for making this recording – to communicate, through music, ideas which I think are of value. If we each, through our individual and collective decisions and actions, largely shape our lives and the world around us, then all of us, including composers, are daily making this world a better or a worse place. I desire that my music shall make the world a better place. That’s my story – and I’m sticking to it!